Here is the first question answered from the “most burning reed question” series that I decided to start 2 weeks ago. Gouge is Innoledy or RDG. Shape is RDG-1 or Caleb-1. I start tip at 66-67 mm. Remove some from back up to 61-62 mm, not too much. In order for reed to play easy and respond to conductor wishes for low notes pp, I scrape the tip, heart. The pitch starts to drop. I clip, reed is too hard. I scrape, reed is too flat. This comes from Pierre. Thanks! 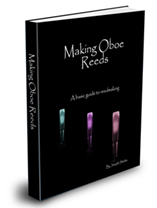 Well unfortunately, this is one of the most common problems that we face as oboe reed makers. Remember that everything in reed making is a matter of balance and just because you scrape a bit from the reed, doesn’t mean a pitch disaster. if the reed is consistently hard, then clipping the tip will only make that situation worse. You need to get the reed really vibrating first. The key is not just in the tip, but the balance between the tip and the heart, through the tip to heart transition. The vibrations need to pass through easily. Make sure that the drop-off between the heart and tip is very smooth and concise, and that the tip is separated a bit more. Get the heart vibrating and don’t be afraid to take a bit more out of the back. This will allow you to clip the reed again without loosing the vibrations. Make sure that the end of the tip is thin. Low note response is basically all about vibration, vibration, vibration. The whole reed needs to work together on this one, and remember that a dark colorful sound does not come from a hard reed. It comes from a vibrating one. One other point, you might want to try and use a shorter tube, maybe 46 mm and see if that helps.